Among the ships the country has for sealift and logistics forces, the Government Accountability Office has found a steady increase in mission-limiting equipment failures, which raises questions about how many might actually be available if the balloon goes up. The 46 Ready Reserve Force ships, overseen by the Maritime Administration, are old and rapidly approaching the end of their hull life, as are many of the senior engineers who are still qualified and able to work on the aging steam propulsion plants. This is setting up a struggle to get more funding into sealift as the Defense Department realigns itself for the potential of largescale combat operations after 17 years focused on small wars. 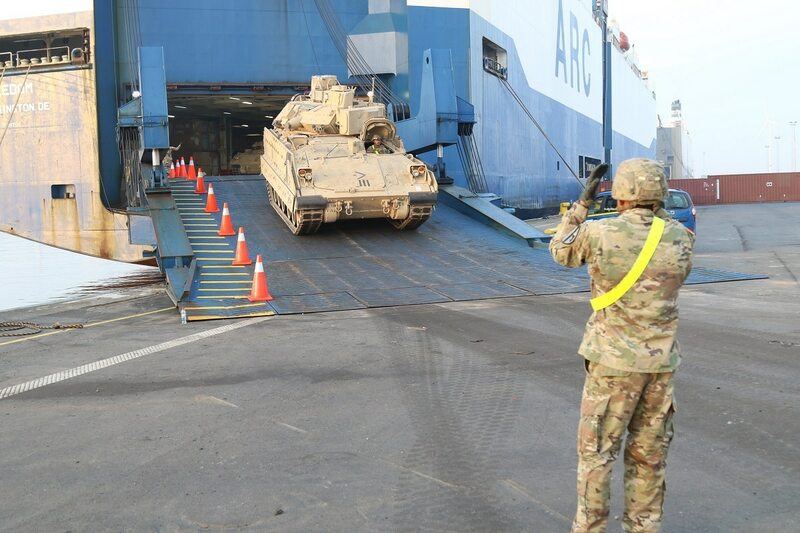 In 2017, the Army deployed two heavy Armored Brigade Combat Teams to Europe back-to-back, including their state-side heavy equipment, and is looking to move even larger groups in the future. But if the Army is to get in any large-scale fight in Europe, it has to start thinking big, said Jerry Hendrix, a retired Navy captain and analyst with consulting firm The Telemus Group. Of the 46 ships in the ready reserve force, which combined with Military Sealift Command’s 15 roll-on/roll-off container ships makes up the U.S. surge fleet, 24 are steam operated. Steam is largely obsolete in the commercial world that the U.S. relies upon to keep its emergency stock of trained mariners employed and in seagoing careers. And the hulls themselves are rapidly approaching the end of their useful service life. Of the 46 ships in his reserve force, about 23 or 24 need urgent attention, Buzby said. The Navy has a plan that includes a mash-up of service-life extensions, new-build replacements (the most expensive option) and buying used ships from the commercial market that can measure up to the task. But a used ship could cost anywhere from $75 to $100 million, even before the needed retrofitting and modernization bill that would accompany such a purchase, he said. A Navy estimate found that some ships couple be purchased and repurposed for more like $30 million. Related to the issues of recapitalization are a heap of personnel issues. A recent report to Congress from the Maritime Administration estimated that among active mariners the agency would have just barely enough personnel to man the reserve force up front, and if they needed to start rotating crews during sustained operations, the numbers quickly fall short. The Maritime Administration, part of the Department of Transportation, estimates it has 11,768 qualified mariners with unlimited credentials available to crew the Ready Reserve Force, a number that just barely exceeds the needed total of 11,678 to operate both the reserve and commercial fleets at the same time. But that comes with a big catch: this service is entirely voluntary. Furthermore that number is just what it would take to activate the ships and operate them for a little while. If the nation needed to sustain a largescale effort, it would soon begin to falter. And inside that pool of mariners, there is a growing issue forced on the Ready Reserve by its steam plants. All junior engineers come out of training certified to work on steam plants, but the opportunities to actually work on steam are limited to non-existent in the commercial sector. That means most of the operational experience junior engineers get in their day jobs is with more modern diesel systems unless they are actually working for either Military Sealift Command or Ready Reserve Force, opportunities which are of course limited. Some issues are being addressed by doubling up on engineers when the steam ships are operating to get the hours they need in to stay qualified, but the net result of the problem is that there are lots of junior steam plant engineers and a big group of greybeards, and few in between. It’s a problem that Congress and the military, with little fanfare, are starting to focus on. In the 2018 and 2019 National Defense Authorization Act, Congress freed up authorization for the Defense Department to buy up to seven commercial ships, built anywhere in the world, that could recapitalize the Ready Reserve Force. The kicker, however, is that Congress wants the secretary of the Navy, prior to purchasing more than two of the new ships, to submit a plan for a new class of new-build sealift ships. “In order to procure more than two such vessels, the secretary would need to certify that the U.S. Navy has initiated an acquisition strategy for the construction of no fewer than 10 new sealift vessels, with the lead ship anticipated to be delivered by not later than 2026,” according to the explanatory statement released by Congress. The 2019 NDAA also requires the Navy to submit a business case analysis for getting the Ready Reserve recapitalized. Ultimately if the U.S. is serious about great power competition, it has to get serious about its logistics fleet, said Hendrix.